I know. I’ve been away this summer. Loving the out of doors though. Last fall I bought myself a beautiful Mustang convertible and darn it anyway, I used it. My last day at work was the 1st of May and so I chased trains and drove through mountains where there were no trains. It was the chance to be 20 again – but this time with the money. Well, it’s the kids’ money but what the hell eh? There were Winter Valley things going on from time to time of course. Always had visitors over to run trains and swap stories. Some from far away and some from right next door. Also looked after a couple of estate sales on behalf of the local HO club so I was busy. And I finally found my special Ontario Carbonate tank car. Silly story about that. Somewhere in my files I had a forgotten photo that I remembered as soon as I saw the first ad from USA Trains. Sure enough, the photo I had was of a car in their production series. Number 71472 would be the one to buy even though I had all the cars I could ever use. Now finding THAT car was a challenge. After nearly a year I finally found a shop in Boston that said they had that special number. I confirmed it by phone and there it is for you to see. Looking excellent. I still have no idea where I’m going to run it though. The other summer project became THE project. Planned for over five years as I investigated all the systems available that would replace my original DC ‘construction phase’ power. For reasons I won’t go into now I chose to invest big money (for me anyway) into AirWire Drop-In receiver/decoders from CVP and Phoenix sound. All nine engines – all USAT. 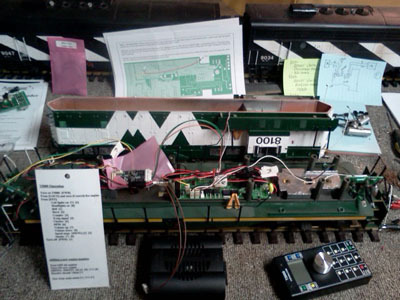 After installing the show and tell SD70 as sort of a training vehicle, and learning how to run the T5000 throttle, I got the F3A/B engines working nicely together and they sounding great. BTW, wrong engine sound in the F’s but the Canadian horn is a thing of real beauty. Now I had to do the three GP7/9s on the layout and so I removed them for rebuilding. The first one didn’t work. It only ran at full speed. Set it aside. The second one didn’t work. It only ran in one direction. Set it aside and then called CVP. They had me send the Drop-Ins down to Texas for testing. No charge. Even the one I hadn’t installed yet. Nice eh? Well, they are on the way back as I write this and they tell me there was nothing wrong with them. Ouch! That hurt. How could I have screwed up two installations like that? Simple ones as well, except for a small board modification, which BTW, I had done correctly. We shall soon see and I promise to report all. My GP38-2W is next. I have the boards in hand. Just waiting for the SD40-2 and NW2 Drop-Ins to be released. I shall over come. But enough of that. The main reason for this update is a final scenery challenge that sat unfinished for about 12 years. I just couldn’t figure a way to get it looking right so it was left undone for all to see. Check out the white area center left and the funny looking duck-under ‘bridge’ just below it. Also the darker brown bump at track level just left of the screw post. There is also a dark spot under the track right in front of the lead SW1200. That whole section – left to right – had to be done right away. An open house was coming up on October 21st. So now I’ll take you past the mess I’ve made in the basement and show you the results to date. Some small details will be added and adjusted over the next few weeks but you’ll get the idea. First off, that odd styrofoam bridge has been ripped out and will be replaced with a steal arch of my own design sometime this winter. Much more on that later. This is a prairie railroad. I spent a goodly part of my life out that way but I took a special trip back to Saskatchewan in 2009 just to do a photo shoot of scenery and trackside structures. One of the results of that trip was this small slough used to break up the monotony of the flatland between Pearson and the park. That small vignette has been the junction between what was the Plywood and Western and long sceniced railroad. This new construction project would have to start right there. Exploring further this idea for a minute. 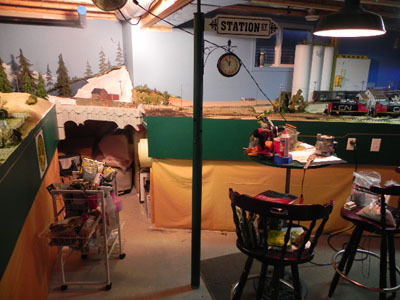 Many modellers are absorbed in “The Big Scene” and ignore the small scenic details that give the layout life other than grandeur. 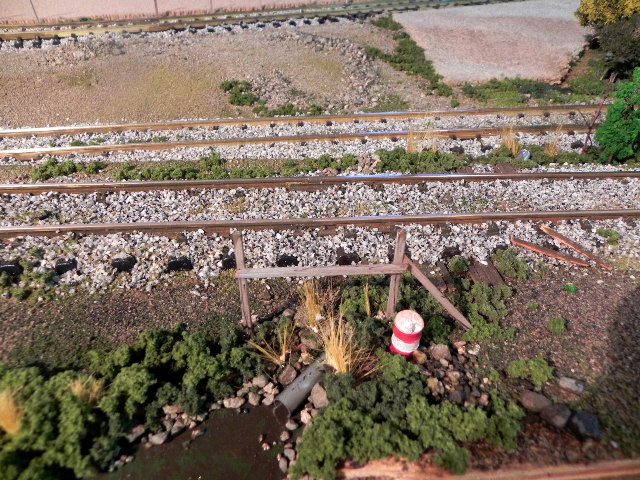 At first I thought that this was just a feature of HO and N railroads because of the relatively large space they had to work with but that’s not true. 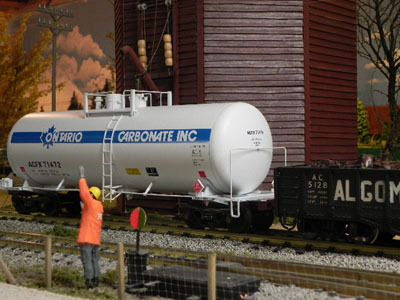 There are far more small detail items available for small-scale railroads than will ever be available to the O and G crowd. Most modellers just don’t take the time or make the space to use them. So this small water filled slough fits into the edge of a large wheat field. It offers a tiny scenic distraction from the otherwise flattish bench work and a spot of realism next to a boring section of track. Just like in the real world. So that water had to drain somewhere, or come from somewhere, and I had just the thing for that. The plywood surface of the bench work was left a little cockeyed at this point in order to fit it economically into a larger area. That left a small, relatively lower area to fill with scenery. I could’a just filled it with wood but what the heck eh? You can see that the roughly triangular space was painted a muddy green and topped up with a clear gloss coat or two of Varathane. A ½ inch section of aluminum tube was cut down and laid into the corner. Another small piece of tube was fitted, unseen in this picture, into the embankment at the other side of the tracks. 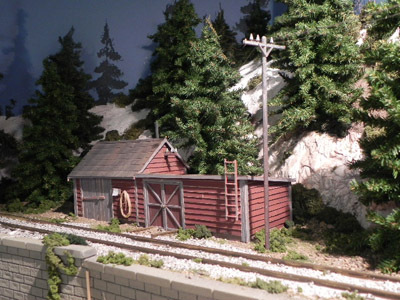 Add a few stones and some Woodland Scenics material and it’s pretty much done. Just so my workmanship <grin> isn’t overlooked completely I added a small useless safety railing and a nice little red and white barrel of some kind. It’s 1975 anyway so dumping oil products into a small stream isn’t unheard of. There are timbers above the culvert and between the ties in this scene but they may be covered with ballast in this picture. Just a small detail that ties the two scenes together. Small scene – took 20 minutes – cost nothing. Here again, something silly and cheap. That little hill of wire and plasterer that sprung up next to my duck-under was left to form a coulee where the trains would enter and then disappear around the bend. What to do now? It still served a purpose by transitioning my prairie landscape into my mountain park area. A new bridge could do that and it will. Someday. But I covered the hill with Woodland Scenics and twigs from the garden. 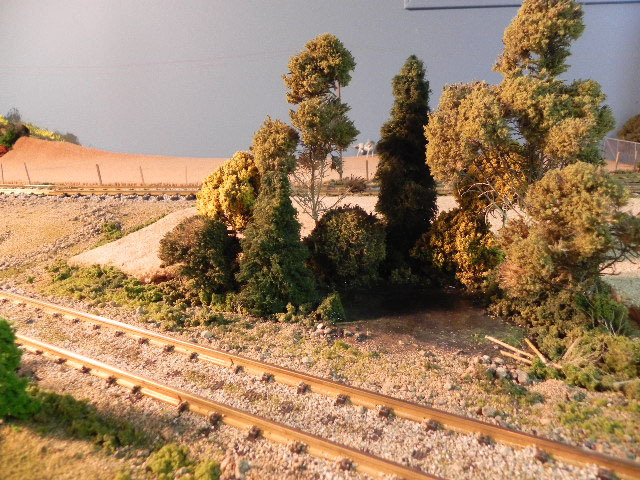 Then I planted a few better looking twigs as dead or late fall trees along with some of the Chinese HO scale trees we used at the local public display. They are so cheap and so green. They will be left in their new home for a few weeks, or until I’m happy with their location, at which time I’ll pull them from their holes, recolour them with fall colours, and put them back. Just a point on scale. How big is a tree anyway? 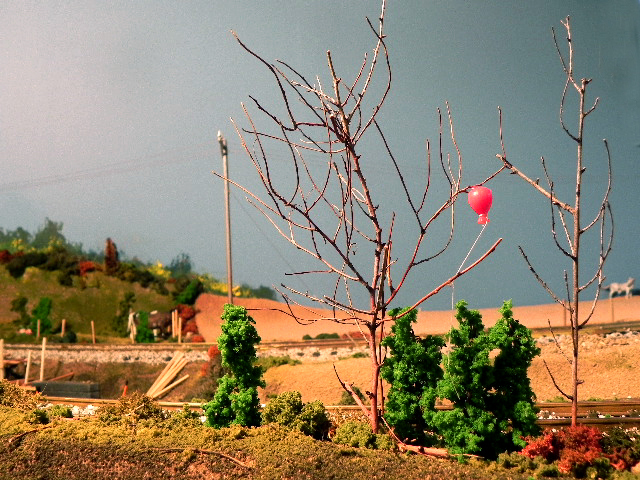 These trees from China are about 20 – 25 feet high in HO scale but make ok 6 – 8 foot bushes in G scale. I wouldn’t even bother to read the ‘size’ on commercial trees. Just find what you need. Just error on the side of BIG. All of us who model prairie scenes are stuck with the problem of how to change the elevation of the tracks without making Eyebrow SK look like downtown Boston. In my case I have two levels in the basement. Just over 40 inches in the future lounge/sitting room and 52 inches throughout the rest of the layout. Easy to hide one ‘hill’ behind the furnace and water tank but what to do south of Pearson? For a long time my local spaghetti bowl faced viewers while I was faced with finding excuses. But in the space provided there seemed to be none. I would simply have to make the quick change in elevation look as small and interesting as possible. So I found a bunch of heavy cast concrete walls down at Art Knapps and bought up about 10 sections, each about 10 inches by 4 inches, and then cut and fitted them into place along the side of the upper track. The wall grew to over 5 feet in length and quickly started to look like a Montreal subway station – without the style and colour. The only thing left to do was break it up by creating a more interesting construction zone. By chance there was a large earth moving and wall construction project going on right here in Peachland as the highways department carved out the side of a mountain to install a new intersection. Lots of ideas were born right there and so I used plenty of timbers and plywood sheets to shore up the earth and backfilled the roadbed on top. Just sticks and stones and small pieces of veneer really. The addition of a couple of workmen and their tools managed to scale back the visual size of the whole feature. The largest area of reconstruction was immediately around the high mountain in the far corner of the basement. This was hard to get to because of course I built bench work and laid track years before I spent the time to scenic the darn thing. One of those Topside Creepers you see advertised now and then was borrowed (They’re quite expensive) and put to very good use. Highly recommended if you can get your hands on one for a case of Alexander Keiths. This is up in Mountain Park country so the snowline is at track level just as it is at the other side of the basement. Only the mine up at Colder comes between. The speeder shed and annex are from photos and measurements I took while wandering around north of Winnipeg back in ’89 sometime. Just a great little structure and now it finally look at home. 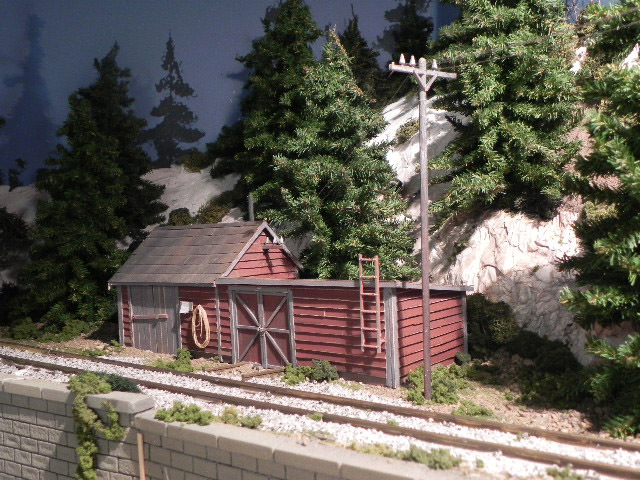 It’s a darker corner so I’ll eventually add lights to the power pole and above the shed door. This job is done. Now I have to clean up my mess. I just hate having a messy train room. Most train nuts will step over your junk without commenting but interested non-rail visitors need to see you at your best. I’m going to try to get something more in What’s New before Christmas, perhaps the AirWire thingy, but for sure there will be a Proto-file entry based on a summers travels in BC. See you then.